Every journey is unique, special and absolutely heartwarming for the person who goes through it. The result of our own personal journey, as a dice manufacturer, is the one that now thousands and thousands of RPG fans can enjoy while playing. 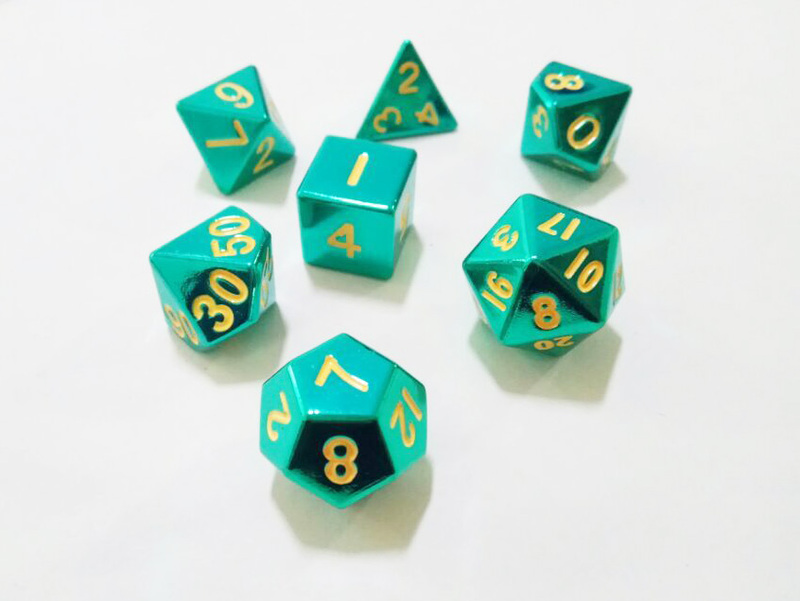 They can feel the passion through every step of the game and, now, they can also feel it through the custom metal dice that they hold in their hands. The dice set of an RPG is a vital part of the entire experience: without it, it’s impossible to play. Being such an important part of the game, we wanted to make the dice sets a reinforcement of the RPG vibe. RPG players risk their destinies when they throw those dices, the cool metal feeling comforting them, and we are part of that. How were we able to transform the traditional acrylic dice set into one that could reflect the emotion that RPG players experience when playing and the aesthetic of the fantastic RPG’s world? This is our journey to discover a new RPG dice: The Innovative Story of the Metal Dice. This story began in August 2014, when Blue Shift Nine LLC, a major RPG dice wholesaler, and distributor in the United States, approved the quality of our products and our customer service after purchasing a large order of acrylic dice from us. Our association with Blue Shift Nine LLC, who distributes acrylic dice and has exceptional features in acrylic product packaging and product mix, helped us to give the first step in our journey. Mr. Cory, CEO of Blue Shift Nine LLC, proposed us to step up our game further. He wanted to introduce an upgrade to the RPG player experience modifying one of the most essential tools in RPG games: the dice. As a China dice maker, we know that the acrylic dice is very malleable because it is made of a versatile material. DnD dice need to match the aesthetic of the game and the player, and a blunt white color is definitely not going to be enough to represent your aasimar explorer or your human warrior, let alone your tiefling warlock. It needs to be a custom dice. Mr. Cory, an RPG player himself, often heard from other people in the community: “I want to have a cool RPG dice set”. That was our keyword. “Cool” was what we had to aim for to contribute to the innovation of RPG dice game. So now a new question arose: what is “cool”? We determined it’s a feeling, an experience: something that the traditional acrylic dice cannot make players feel. In the process of discovering this new cool dice set, Cory and TOP IMPRINT team continued exploring the acrylic production process and the color matching. TOP IMPRINT started the creation of a new RPG dice set, with the collaboration of Mr. Cory and his insight. We are a dice supplier, so we showed Mr. Cory every step of the production of the acrylic dice. Finally, Mr. Cory and we were able to create a dice set that has that cool vibe D&D dice should have: we made a charcoal dark dice, with silver font. The silver color pops out on the black background. When we sent the picture of this brand new dice set to Mr. Cory, he was just as excited as we were: we had studied the whole process of dental dice production in detail and we were very knowledgeable in the properties of the acrylic material. After trying every technique on the book and inventing new ones, we had achieved our goal. Mr. Cory thought that should be the “cool” feeling the RPG players were referring to. He organized the group of players that were going to be the first ones to try this revolutionary set of dice. We sent the first shipment, three sets of black and silver acrylic dice, to the United States and waited for feedback. The feedback we got from Mr. Cory was opposite to what we were expecting. Although the RPG players did like the new design, they didn’t feel any difference when holding the dice. They obviously couldn’t see the colors when they had the dice in their hands, so the feeling, the experience, was lost the moment they started playing. Mr. Cory realized we couldn’t just improve some features of the original product and expect them to reach the customer’s desire. And that maybe we should not keep pursuing meeting these expectations because, after all the hard work done, we didn’t reach them. But TOP IMPRINT was determined to make the difference in the DnD RPG dice game. Yes, changing the colors was not enough to achieve a “cool” feeling. So we decided to redo all our production stages and keep working on a new way to make the acrylic dice cool. One day, we finally got a hint in the right direction: TOP IMPRINT President, Gary, had a project negotiation with an engineer in a hardware factory and heard something enlightening. The engineer said: “Plastics and hardware are separate”. Gary knew he had found something useful, so he asked for further explanation. This conversation was communicated to TOP IMPRINT R&D team, that found out that the differences between plastic and metal come from their difference in weight: they have different densities and that modify how they feel to the touch too. When you hold metal it feels heavier than plastic and, since its surface temperature is lower, you feel it cooler than plastic too. And that’s when we all see the answer: the concept of the metal dice was born. We began the production of the metal dice and we were surprised with our first samples. Holding metal dice was definitely different than holding acrylic dice. The difference was as natural as holding a cube dice and a polyhedral dice for Dungeons and Dragons: even without looking at it, you could spot that they were not the same. You could feel it was cool. So we began the production of metal RPG dice sets. TOP IMPRINTS passed from being an acrylic dice manufacturer to be, as well, a metal dice manufacturer. 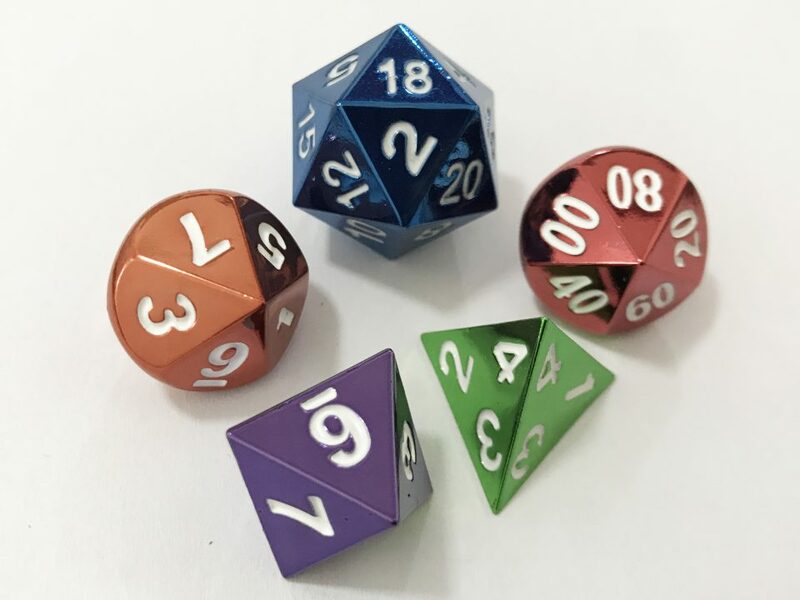 We innovated in the RPG world with a DnD dice that was part of the game experience and not a separate entity: now, when holding our custom metal dice, you can feel the weight of each of your actions when playing an RPG. 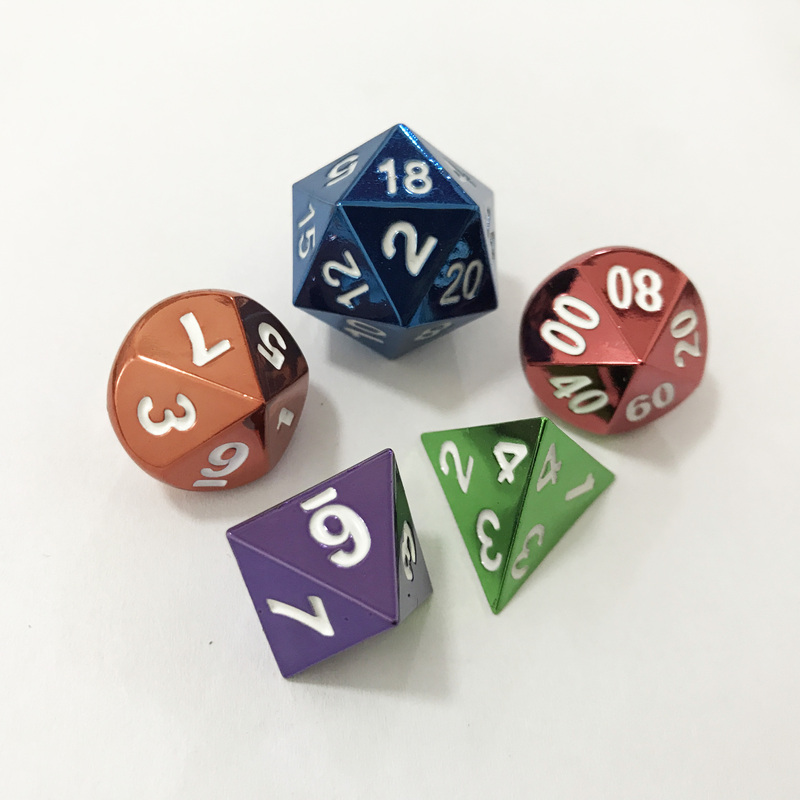 Now, when holding our custom metal dice, RPG players can feel how cool they are. That’s how we became the first company to produce metal dice. Our journey hasn’t ended yet, since, as a dice game maker, TOP IMPRINT feels proud on our commitment to the RPG community and we support their passion for games, so we continue challenging ourselves and improving our services and products. the initial try on metal dice development is quite important and the improvement also more important than that for our metal dice clients and dnd dice game players.